Emergency Response, 2 Hours or less! Call (713) 264-2829 now! Ranger Security is full-service security company located in Houston, and servicing the entire state of Texas. We provide highly-trained and experienced security guards, patrol services, and armed and unarmed protection services. We are a family-owned business and we have more than 33 years of experience in providing exceptional security services to companies right here in the great state of Texas. We are properly registered and licensed by the Texas Department of Public Safety and our licence number is B19232. 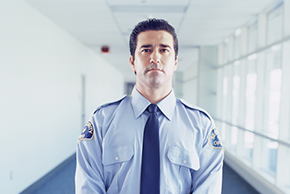 We employ only the most experienced security officers in the area. Our entire team of security professionals must undergo a comprehensive background check, pass a drug screening, and complete a series of intensive trainings prior to working for us. To ensure we maintain the highest level of security, our team is constantly undergoing additional training and adhering to random drug testing. This ensures that we provide only the most experienced and well-trained security professionals in the area. Our vast experience and commitment to providing customized security solutions for our customers has helped make us one of the leading security agencies in the area. If your business needs temporary or long-term security solutions, contact Ranger Security today. Our knowledgeable staff will be more than happy to explain our services, answer any questions, and assist you with setting up security for your company. We guarantee that you will not be disappointed with our top-rated security services.